Over the last year Vuze's BitTorrent client has evolved into an all-in-one download solution. With built in search, device integration and DVD-burning capabilities the Vuze team has set itself aside from other BitTorrent clients. With more than 100 million videos transferred to iTunes, game consoles and TiVo, device integration has proven to be a popular feature among Vuze users. Vuze saw its initial release in the summer of 2003, when the application was still named Azureus. In the years that followed Vuze grew out to become a serious business, and their cross-platform BitTorrent client evolved into a fully featured multi-media application. With more than 100 million downloads of the application since 2007, Vuze is one of the most recognized BitTorrent brands. The client is used by millions of people each day which makes it the second most-used BitTorrent client in the western world after uTorrent. In recent years, Vuze has turned away from being just a download client by including several new features. One of the additions made in late 2008 is a search feature that returns results from torrent sites within the application itself, so users don’t have to use their web browser. This search feature has been well received and is widely used by Vuze users. “The Vuze community conducts over 50 million searches per month, a monthly number that continues to grow by over 5% every month,” Vuze’s Director of Marketing Chris Thun told TorrentFreak. These searches are a significant traffic source for supported BitTorrent clients. KickassTorrents, one of the most recent additions to Vuze’s search engines reported a huge traffic spike thanks to Vuze. After it was included, the site received an additional 100,000 unique visits a day. 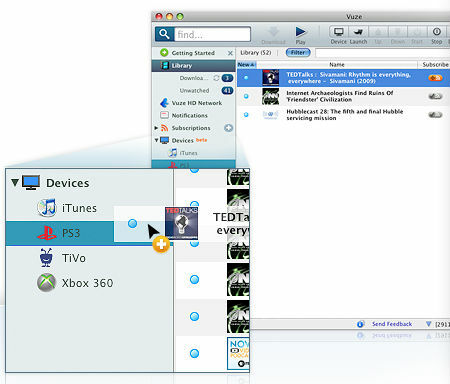 In addition to search, Vuze’s device integration with iTunes, Xbox 360, Playstation 3, PSP and TiVo is also appreciated by users. More than 100 million videos have been transferred by Vuze users to these devices in the last year. Focusing on more that just downloads has been a concious choice for the Vuze team. “The risk is that BitTorrent software will eventually hit a wall if the competitive field narrowly focuses on downloading, and fails to solve some of the basic usability walls that currently exist in many of the major clients,” Thun told us. “BitTorrent users increasingly want the ability to easily find, download, and play content available across the web. Vuze has focused significant effort on filling a few key holes in this broader use case,” he explained to TorrentFreak. It is good to see BitTorrent clients becoming more user centric as they continue to evolve, something that’s much needed in the competitive field. Disclaimer: Vuze is one of TorrentFreak’s sponsors.